I'm a new guy that has started my very first engine. I've been lurking for a while and wanted to finish this little project before showing it. But every time I go out to my shop, I get interrupted, (I volunteer as a Fireman/EMT on a small rural department). Seems everyone knows when I head to the shop. My pager never fails to go off. So I figure if I post my start on this, I will be more driven to finish. I will be building a simple wobbler, "The David" by Alan Marconett. A simple engine compared to much of the work that is done by all of you here. But I think there is much I can learn from it. I cut a piece of aluminum to start the upright. I had firmly intended to get it sawed, milled square and to length and all holes drilled and reamed. But my pager went off and I had to stop and do a medical call. So I didn't quite get it milled to length tonight. But I did get one photo of milling my stock square. I hope to be able to get the upright done tomorrow night. Provided the dreaded pager tones stay silent. Don't you worry about showing your first engine build. It takes guts to put yourself in the public eye. Everyone on here has been through that experience, and they all know what you are going through. It will be a massive learning experience for you, and of course, as you get a little more into your build, people might start to suggest different ways you could have done something. Don't get annoyed at them, they are only trying to help you become a better model engine maker. Just absorb what they say, and use the hints and tips they give at another time. If you get stuck on how to hold or machine a part, then don't be afraid to ask, I still do after many years in this game. But one two things above everything else, even if you balls it all up, enjoy what you are doing and learn from your mistakes. Thank you for your service, and welcome to MEM! We're a good bunch....and we like pictures!....Like John said...if you need something just ask!. Welcome dalee. I'm happy you decided to jump in and post your build. That first engine will always be special and by sharing it here, you allow us to join in that with you. Everyine here has been just where you are and I think you'll find us a helpful and very supportive bunch. Its not a race either so take your time and make progress as you can. Welcome to the forum. Does not matter what your skill level is there are always questions to ask and new skills to learn. So feel free to fire away. Someone here will know an answer or how to do something. I'm right there with you !! My first build going on as well. Wish you all the success to complete a fine engine. Good to hear someone else is working on their first engine also! I guarantee that I will have questions to ask, in fact I can use some guidance already. But first. I was setting up to drill all the holes in the upright tonight. When I got to the two 1/16" holes for the intake and exhaust ports, I discovered that I do not own a drill chuck that will grip that small. 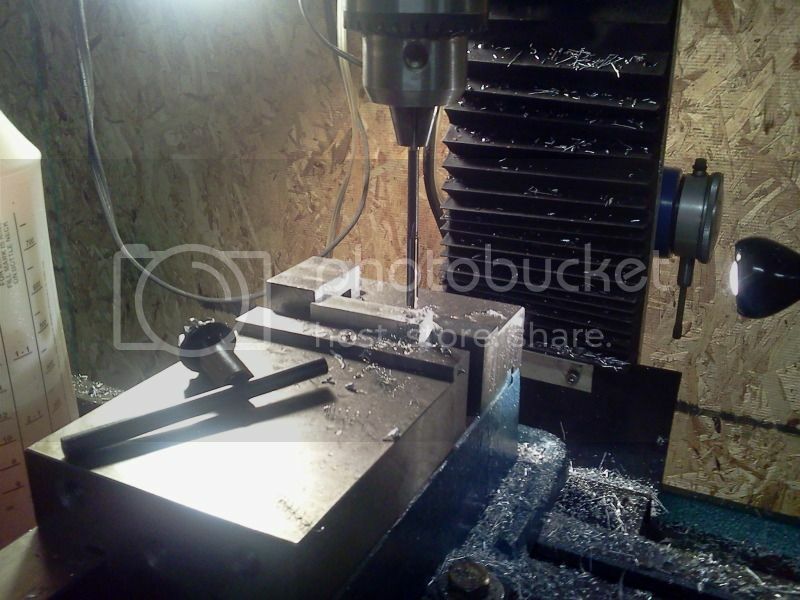 I have 4 mounted chucks, 2 on MT2 for the drill press and lathe and 2 more for the mill. Who does that? Will need to run to town tomorrow and see what I can do. Maybe one of those quick change drill bits in the aluminum hex? Now for some guidance. I went to work on the cylinder. 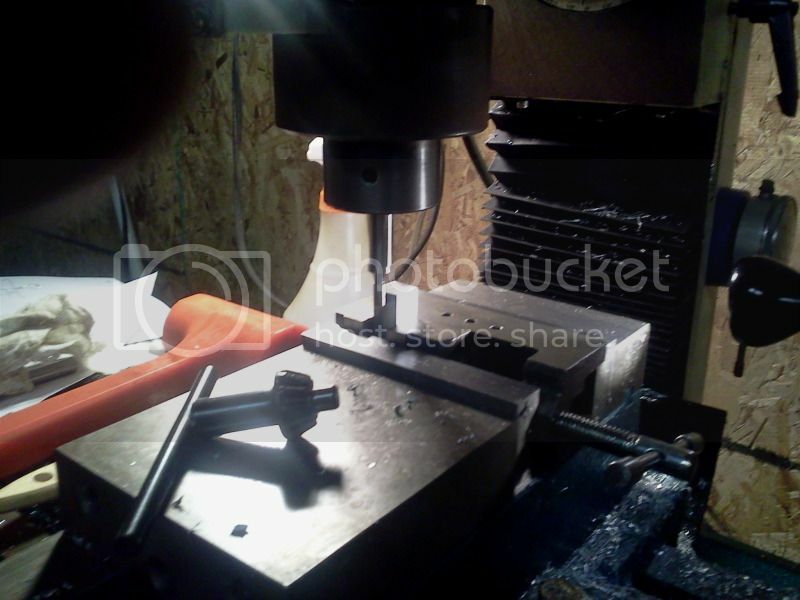 I got to the point of drilling the bore for the piston. Looking at the print, it shows a flat bottom. Is this important? I know that the cylinder shape and volume can matter on more complex designs. I had planed on simply drilling the cylinder, as I don't currently have a 3/8" reamer. I could take a spare 3/8" drill bit and repoint it to a flat profile to finish the bottom. But is it necessary? Thanks for the fine welcome! Can you post a sketch? I dont think it really matters, my first wobbler was just drilled and reamed. But if you wanted to you could just taper the top of the piston to take up the clearance. Heres my first engine, not the prettyest but I only spent a couple of hours making it out of what ever I had and with out plans. I made that same engine as my first, and asked almost that same question. Best answer I got was a warm advice into forgetting about reamers, boring the cylinder than lapping it to size and finish. It worked for me, happy to pass it on to You. As for holding tiny bits, I took a proxxon/dremel chuck and mounted it on an arbor. I see You're making the upright into alu., I would not make the cyl. into that same material. That's personal experience: it lasted a few seconds only. OK...Marcello makes a point there. Though a good finish off the boring bar might be sufficient..
You will need to build your tooling collection as you go. May not be a bad time to start your reamer set. Just get the most common and you will get a lot of use out of them. In fact you may change a design based on what sizes you have on hand. I started with 1/4, 3/8, and 1/2 and get a lot of use out of them. I also keep drill rod in those sizes. Very handy to have some drill rod and matching reamer! I have seen other examples online but this gives the idea. Best to use tool steel and harden with heat. You can also take some aluminum rod and turn it just under size, spit it down the middle for an inch or two. Put some emery cloth in the slot and wrap around the rod. It is not precise but it will smooth out a bore that is not critical. Then make the piston to match the final size of the bore. If you are using aluminum for the upright AND the cylinder, make sure the surfaces are really smooth and keep plenty of oil on them. Aluminum tends to gall when rubbed together. Lots of ways to skin cats in this game. As always these are just my opinions. You results may vary. I haven't forgotten this build yet! Just been working through some life. I appreciate the advice for far. This is has been an enjoyable learning experience. I think this could get to be pretty addicting. I did get a couple of relaxing hours of machining time this afternoon. So I managed to get the upright and cylinder completed. I took a couple of photos to document. Drilling and reaming the pivot for the cylinder. How to drill a 1/16" hole when your drill chuck won't hold that small. I picked up a 1/16" drill meant to be used in a quick change chuck for cordless drills. Only cost me $1.50US. Edge finding the end of the cylinder to find center for the bore. I did manage to get a relatively flat bottom hole. I agree with the knowledge here that it isn't really necessary for these engines, but I decided to take the challenge. I rummaged up a damaged 3/8" drill and reground the end to flat. Add a bit of relief at the lips and I was good to go. I used a standard point 3/8" drill to drill to depth and then used the modified drill to flatten the bottom. I had some reservations about re-drilling the hole because the second drill often does bad things to the hole because of rubbing on the sides. I got pretty lucky and it turned out well. Just .002" over the nominal size of .375" and no ballooned out center from side rub. And the finish, while not ground, is pretty good and should clean up pretty easily. I will probably hone it smooth with black85vette suggestion. And my depth is just .0015" short of print. I am quite satisfied. Completed upright and cylinder. They still need polishing, but the machining part is done. I hope to try and get a couple of the small parts done tomorrow night. And I think another trip to town is in order for some steel guitar strings to make springs out of. I've never made a spring so now is a good time to learn. Sorry about coming in late with a bit of advice. Almost the easiest way to get your flat bottomed hole is to use a trick that is frowned upon, but can get you to where you need to be. 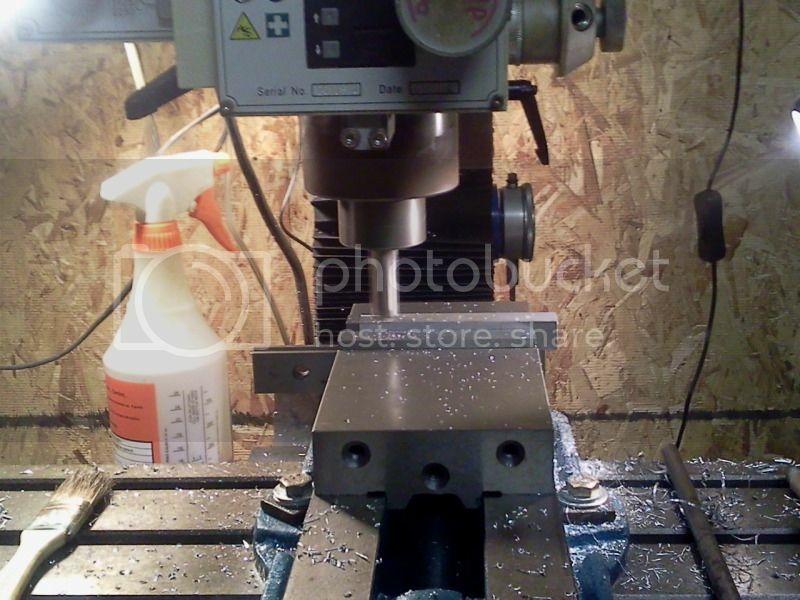 Drill down as far as the hole needs to be with one size smaller drill than what is needed, then, horror of horrors, mount up a milling cutter of the correct diameter into the chuck and just drill down to the overall depth required. If you take it very steady, that will clean up the bore enough for a little engine such as this, and give you the flat bottom hole that you desire. I do this a lot when I am putting in counter bores for cap head screws. 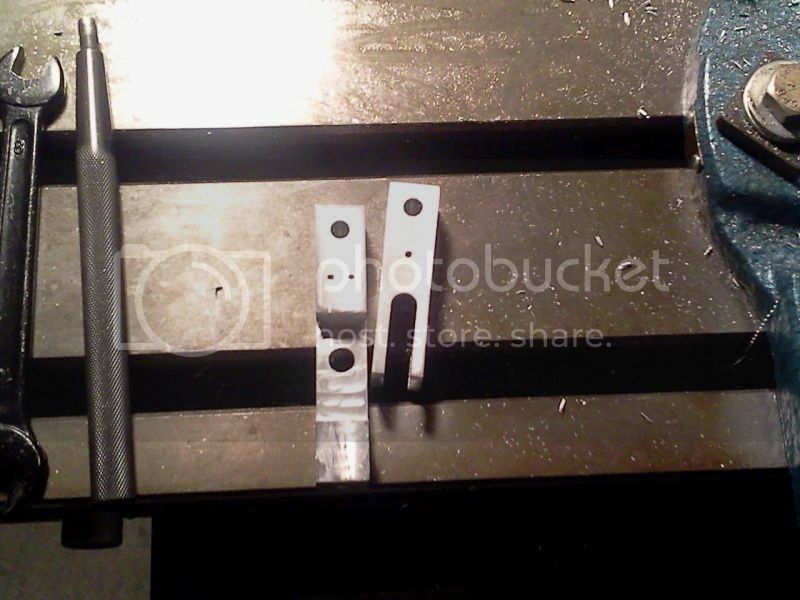 I mention this because if you are not taking a lot of material out, then there is not much force on the cutter to cause it to slip in the chuck, which is what would happen if you tried to do full scale milling with a mill cutter in a drill chuck. Another point, if you do use this tip, if you can, always try to use a centre cutting mill cutter. With regards to holding small drills. 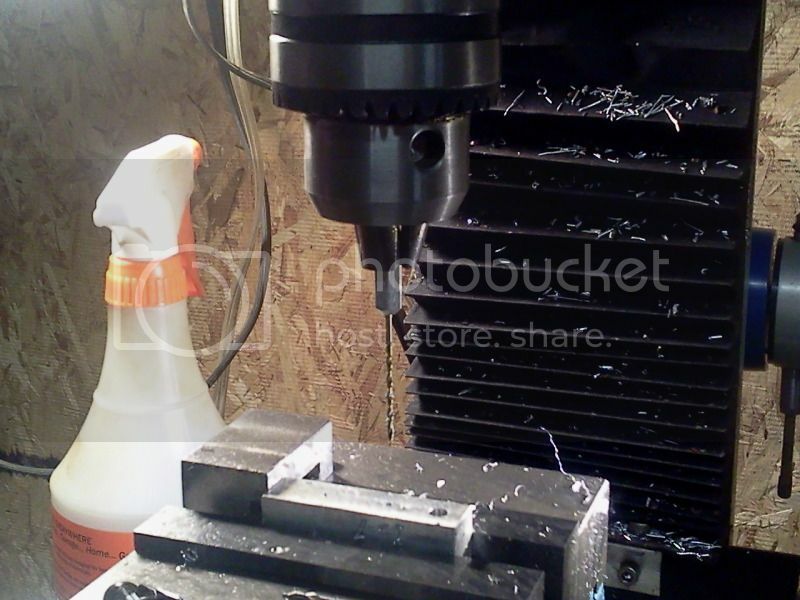 When your finances allow, invest a bit of money in a PIN CHUCK, it will be money very well spent, not just for use on the mill, but on all your machinery that you can drill with, and even by hand using at times, just to do a bit of hole cleaning out or fine countersinking. You might also find a set of PIN VICES very handy at times, but not for holding things when mounted into another chuck. Looks like you are making some good progress Dalee. One step at a time and you will be there before you know it with a nice runner as a result. Yeah using an endmill to make a flat bottom was my first thought also. But the hole depth is just a bit shy of 1.375" deep, (which I didn't mention - my fault ). None of my 3/8" end mills are near long enough to reach. I did briefly consider relieving the shank of an endmill, but I wasn't sure I would have enough good shank left to grip properly. The suggestion to get a pin chuck is good. I didn't think of them and it looks like I should have one. It certainly would be cheaper than buying more drill chucks and arbors. I did look at a tiny drill chuck mounted on a hex shaft at the local hardware store. Very similar to your pin chuck. But the quality didn't look very inspiring as the jaws didn't close evenly. So I opted for the quick change drill bit instead. I cut a couple of small shafts tonight and turned them to length. Which kind of brings on another question about tooling. I have noticed that model engines tend to use screw thread sizes, that for me, are a bit odd. Like the 1/4"-32 and 3/16"-36 used in this build. Oddly enough, I do keep a 1/4"-40 tap and die on hand, (useful for small precision lead screws and nuts), and I will swap #10-32 for the 3/16"-36. But do I need to start on a collection of sizes and types for model engineering? Do you buy or make your own taps and dies for this? The finer pitch threads come in real handy for plumbing fittings...ect. Well, I have a problem Houston. After making the cylinder, piston, crank disc and pin, I find that either the hole depth is too short or the piston is too long. As it bottoms out on the top of the cylinder. And as near as I can measure, the piston is 3/16" too long. I have remeasured and rechecked my parts against the print and they are to spec that I can see. So somewhere, some how, somebody made an error. Not really the end of the world. If I make the cylinder hole deeper, which can be done, will I need to move the intake hole for the air closer to the cylinder head? Or should I shorten the piston more? Does the intake position matter? Attached is a pdf print, (sorry photobucket is not letting me upload). What I have is the right image. The white is the cylinder housing. The green is the piston. The magenta is the crank wheel. The blue is the standard/upright. As you can see, the green piston extends well beyond the top of the piston at TDC. 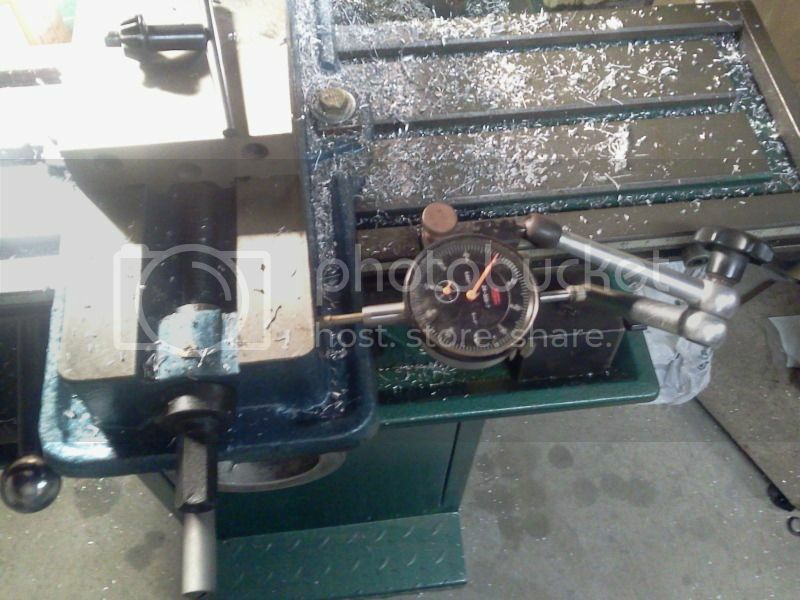 I'm leaning to drilling the cylinder hole a bit deeper and then shortening the piston a bit too. Or have I made a mistake and need to remake some pieces? Awww carp. Ain't no color in the pdf. no worries Dalee....is the shortened piston still longer than it is in diameter? IF so ....you'll probably be just fine....otherwise...can you shorten the piston rod instead? I just had a look at the plans for this engine and they are pretty confusing when it comes to the measurements, and they just don't add up for me either. From what I can see, you'd have to shorten the piston by about 1/4" - that shouldn't be a problem as it's running in a cross-head all the way. Just for clarification for Steamer: there's no connecting rod in this engine; the piston drives the crank directly. Changing the porting is not much of an option, as you have already drilled some of the port holes. By deepening the bore, you'll just end up with a lot of "dead" section where the air inside the engine will not be able to exhaust or get air pressure into the engine; and the "dead" section will add a lot of back-pressure from compression resulting in a poor runner. Having said that, the way the porting is laid out in the plans, it will have quite a significant "dead" space around top and bottom dead center anyway. I'd just recommend shortening the piston a bit at a time until you can get it to turn without topping out in the bore and giving the engine a go; you might not need the entire 0.625" I'm thinking of. I'm sorry to say that I don't think this engine design will make a good low-speed low-pressure runner; it will require quite a bit of air pressure to run... - but it should run. Thanks for looking at the print Arnold. At least I'm not seeing things that aren't there if it isn't working out for you either. I'm stil having problems getting photobucket to take my uploads. Otherwise I'd post my take of the print. Well I tried the easy fix by shorting the piston. I took off about .160" before it went over center. Now the piston is so short the top of it actually is exposed at the bottom of the stroke by about 1/32". So, I'm not too encouraged by this development. I think what needs to happen is for me to remake the upright and then relocate the 1/4" flywheel shaft the .160" lower. I should then be able to remake the piston to original size and it should work. I think this is where the print went awry. I'm actually enjoying this process. I like the problem solving and it's been an excellent learning experience. Which is why I decided to make an engine in the first place. And a big thanks for the encouragement!